Pat McCarran was the chairman of the Senate Internal Security Subcommittee that investigated the administrations headed by Franklin D. Roosevelt and Harry S. Truman. In September 1950, McCarran and John Wood, chairman of the Un-American Activities Committee, sponsored the passing of the Internal Security Act. The Internal Security Act, also known as the McCarran-Wood Act, required registration with the Attorney General of the American Communist Party and affiliated organizations. 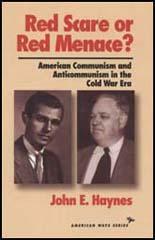 Other sections of the act declared it unlawful to conspire to establish a totalitarian dictatorship, to conceal membership of the American Communist Party when seeking government employment or to use a United States passport. Communists and members of other organizations considered to be dangerous to public safety could also be excluded or deported from the United States. President Harry S. Truman opposed the passing of the Internal Security Act, arguing that it "would betray our finest traditions" as it attempted to "curb the simple expression of opinion". Truman went on to argue that the "stifling of the free expression of opinion is a long step toward totalitarianism." The Congress overrode Truman's veto by large margins: House of Representatives (248-48) and the Senate (57-10). The idea of requiring Communist organizations to divulge information about themselves is a simple and attractive one. But it is about as practical as requiring thieves to register with the sheriff. Obviously, no such organization as the Communist Party is likely to register voluntarily. The basic error of this bill is that it moves in the direction of suppressing opinion and belief. This would be very dangerous course to take, not because we have sympathy for Communist opinions, because any governmental stifling of the free expression of opinion is a long step toward totalitarianism. We can and we will prevent espionage, sabotage, or other actions endangering our national security. But we would betray our finest traditions if we attempted, as this bill would attempt, to curb the simple expression of opinion. This we should never do, no matter how distasteful the opinion may be to the vast majority of our material. The course proposed by this bill would delight the Communists, for it would make a mockery of the Bill of Rights and of our claims to stand for freedom in the world. (2) In her autobiography, Song in a Weary Throat, Pauli Murray wrote about her views on the Internal Security Act. Under the Internal Security Act of 1950, which Congress passed over President Truman's veto, millions of Americans in and out of government were subjected to loyalty clearance programs, which included intensive investigations into their lives reaching back to childhood. Mere membership at some time in the past in an organization listed by the attorney general as a "Communist front" was significant to cause one to be discharged from government service as a "bad security risk". Reputations were destroyed overnight, and professional people were blacklisted on the basis of rumour, gossip, and other unsupported charges of subversive activities.